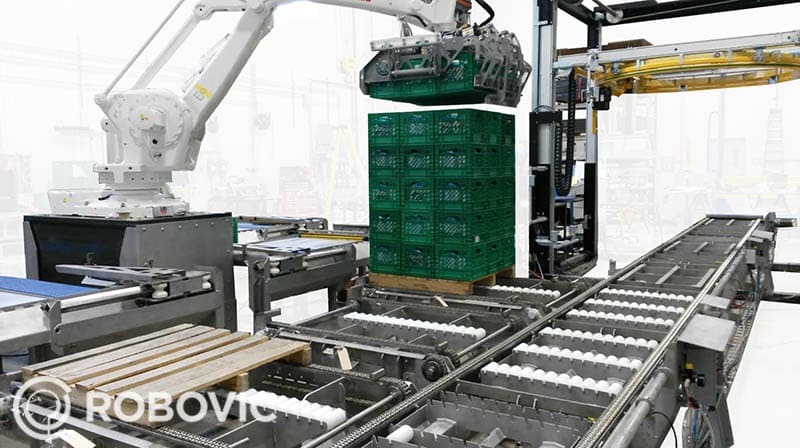 Milk Crate Palletizer | | Innovative Solution | ROBOVIC Inc.
Robovic’s milk crate palletizer is an innovative solution for stacking milk crates. The particularity of our system is in the robotic piling therefore eliminating 5 or 6 stacks of crates on the conveyors. 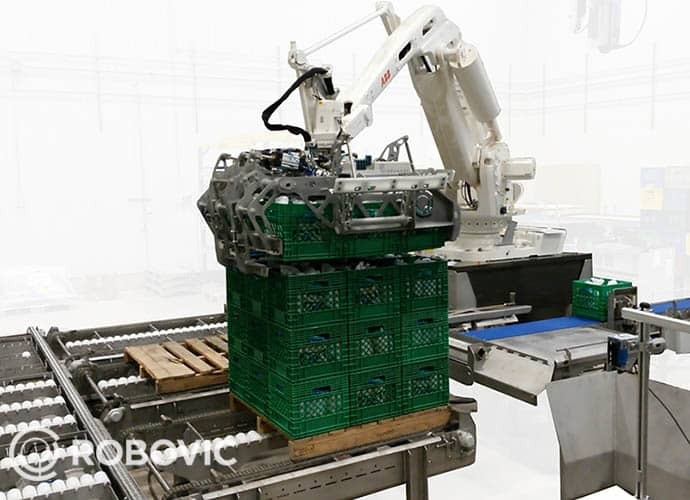 This advanced technique optimizes visibility of the product and also provides easier accessibility of crates and other production lines. The system securely feeds the crates one after the other onto the infeed conveyor. The milk crate palletizer is equipped with a row gripper capable of handling 9 crates at a time. This system can handle partial rows and stacking. In order to obtain high level reliability as well as perfect stacking, the milk crate palletizer is also equipped with several sensor systems that detect damaged or improperly filled crates , broken pallets or unstable stacking. The milk crate palletizer can handle production from several production lines (maximum 4) with speeds of 54 crates per minute. Production speed can be increased by adding a second robot within the same cel. Several additional options such as wrapping and tagging are available to obtain a perfectly integrated solution. Safe, secure and precise deposit preventing crates from falling. Specifically designed for food industry. Eliminates stacker for every line. Secures crates while travelling along conveyor. Avoids wear on crates from traditional conveyors. Wide range of configurations and options possible. Optimized consumption for high energy efficiency. up to 54 crates per minute. Second robot to obtain higher speeds. Faulty filled milk crate detector.